The Everett Mountaineers Lookout and Trail Maintenance (LOTM) Committee has a long history of fire lookout restoration and trail maintenance in the Cascades. We work with the Forest Service and State Park service on three local lookout buildings. And we work with several agencies on trail maintenance. Give back! In addition to lookout restoration and maintenance, The Everett Mountaineers has been active in trail maintenance for many years. 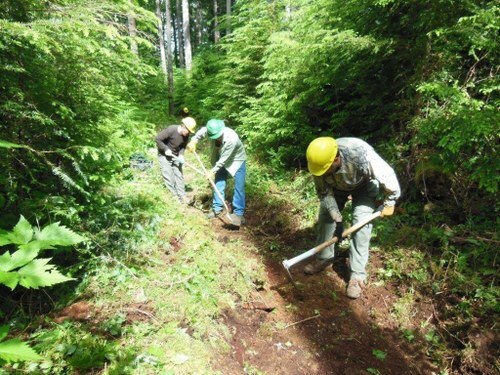 Working originally with the U.S. Forest Service in small groups of volunteers, clearing popular trails of brush and replanting trampled meadows bordering alpine lakes, in recent years the LOTM Committee has sponsored and coordinated 100+ volunteer work parties to commemorate National Trails Day. The Branch's efforts on National Trails Day has won the respect of non-profit organizations and land management agencies, while improving the quality of designated trails, and constructing new ones. Sign up for a work party today! Only 20 miles from downtown Everett, Mt. Pilchuck (el. 5,324') is right in our back yard. A very popular trail heads up from the former skiers parking area. Washington State Parks and The Everett Mountaineers maintain the historic lookout building. 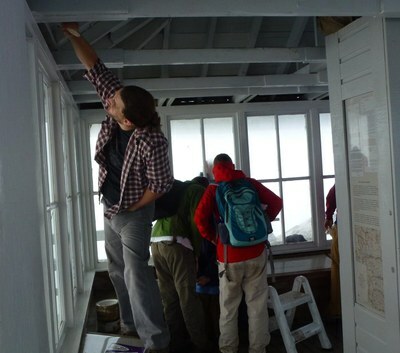 We coordinate volunteers to maintain of Pilchuck Lookout. In 1989, the Everett Mountaineers restored the building. 105 people spent 10,000 hours, with help from Snohomish County Search and Rescue and Army Reserve helicopters. Learn more on the lookout history and info page. In the mid-1980s, The Everett Mountaineers restored the lookout on the southern summit (6,850') of Three Fingers. Three Fingers photo collection #1 and collection #2. 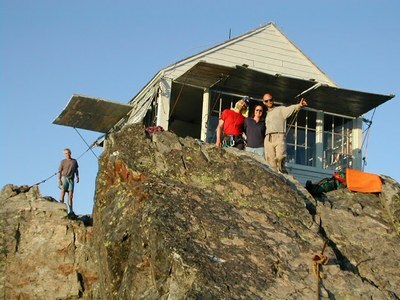 Three Fingers lookout is on the National Register of Historic Places. During restoration in 1986, these photos were submitted to the National Park service . Heybrook Lookout is on Heybrook Ridge just east of the town of Index. Mt. Index is the predominate view from the lookout. The committee wrapped up an eight year-long project in 2002. Hundreds of volunteer hours, and thousands of dollars were donated by businesses and organizations, to restore the lookout, which sits at the top of a 70-foot tower. The Lime Kiln trail is on a route used from 1892 to 1934. The 3.6 mile trail was opened in 2007 by volunteer labor including the Everett Mountaineers. The Everett and Monte Cristo railroad traveled part of the trail, and the lime kiln provided needed material for the Everett Smelter and paper mills. From the trailhead to the river is about one and a half miles. From there to the Lime Kiln is just over a mile, and then it is about a mile from the kiln to the end of the trail, where the river takes a sharp bend to the south. Over a hundred years ago, the E&MCRR continued across a bridge, through tunnel #1 (a.k.a. "The Kissing Tunnel"), and on to the ghost mining town Monte Cristo. Note: check with Snohomish county to make sure the trail is open. LOTM worked on this long-abandoned trial on National Trails Day, 2001. See photos of the work. Drive to Granite Falls (see map) and go all of the way through town to the end by the High School. Instead of turning left to go on the Mountain Loop Hwy, turn right on S. Alder Avenue and go south until you get to a Tee. Turn left on E. Pioneer Street which becomes Menzel Lake Road ( signs says it goes to Lake Rossinger, [Old Anderson Road]). Turn left on Waite Mill Road. After the school bus turn around, stay left on gravel road that climbs uphill. You will come to a fork where both roads have signs that say Private Road. Just a few dozen yards before that on the left is white metal gate giving entry to a car parking area at the trailhead. Maps: USGS Granite Falls, 1989, Green Trails Granite Falls. A hiker supplied a GPS-tracking but is certain that he did not start at the correct place (the track was made prior to the completion of the trail). Not surprisingly, the Lime Kiln "trail" was established by operators of a lime kiln a long time ago. Some of the route is the old railroad route to Monte Cristo. Please don't disturb the artifacts. Robe Canyon history has more information. A progression of USGS and USFS maps show the historical development around the lookout. Colors4 have been used to highlight select, man-made features of interest. A USFS Mt.Baker-Snoqualamie National Forest>map of 1962 shows a trail appears to go to some building near the kiln but doesn't seem to be close to the current trail. The USGS Stilaguamish, 30', 1899 map has trails all over the place going to cabins? Note the older spelling of Stillaguamish. The Northern Pacific Railroad, Monte Cristo spur can be seen in the valley. Pilchuck was a fork in the road along Purdy Creek. The city of Granite Falls was not quite as big as it is now. The USGS Stillaguamish, 30', 1946 map is not much different than the 1899 map. By 1956, everyone in those cabins must have moved to Granite Falls, as the city is bigger and the cabins are gone in the USGS Granite Falls, 15', 1956 map. Wayside mine on the north side of Iron Mountain seems to become an open pit quarry by 1989. In none of the historical maps is the location of the Lime Kiln apparent.